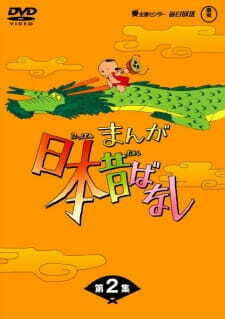 An omnibus-format TV series consisting of anime adaptations of Japanese folk tales, this is one of Japan's longest-running TV series, and Group Tac's second TV series (the first was The Road to Munich, a documentary anime about the 1972 Olympics). The governing rule of the series was that the creative staff change from episode to episode. While later other anime series like Nippon Animation's Famous Works of Japanese Literature would attempt the same, none would be as long-lived or successful. The rotation idea was that of director Sugii Gisaburo, a visual visionary unequaled in Japanese film history who has revolutionized anime several times in his career, be it in the 1967 TV series Goku's Big Adventure, in which he sought to shake anime free from the dominance of story development by yanking it back to a more cartoonish form, or The Belladonna of Sadness, where he broke the Disney full-animation mold, creating a full-length animated film in a completely new style that was a hybrid of still drawings and animation. The reason for rotating the staff each episode was so that each episode would have a completely different look and feel from its predecessor, and in this it was eminently successful. This is a series that is genuinely rewarding to watch, and is visually one of the richest in anime history. While this system also meant that quality varied, there were also occasionally superb episodes, as on the staff were many veterans like Group Tac founder SUGII Gisaburo himself, SHIBAYAMA Tsutomu, FURUZAWA Hideo, RIN Taro, and HIKONE Norio. Old episodes started being repeated more and more frequently as the years went on, and production of new episodes finally ceased completely in late 1995, but the series is still widely broadcast. Well, basically it is a Treasure of Japanese folklore. You don't get a serialized plot or story. It is always a new adventure in new episodes. But, its worth it for the young generation. After all, it is one of Japan's longest-running TV series ever. It has great amount of stories and ignites the passion for anime in young kids.There are three tales in each episode, so it's very easy to sample. The animation style changes with each tale, so there's a lot of variety. But the animation stays simple and very cartoon-y throughout all of the stories. The folk tales themselves are very simple and usually teach a lesson or moral. They're the kinds of stories where the good and hardworking characters will live happily ever after while the mean and cheating characters get what's coming to them. This makes a great relaxation anime. The stories don't require you to think much, invest much time, or worry about the characters. It's the perfect show to watch with a cup of tea or hot chocolate and just settle down and feel like a child again. If you don't like folktales, then there's no point in watching this show. If you do like folktales, then you need to watch this. If you like cultures or want to know what all of those tales referenced in an anime are, then this is a great resource. I learned the folktales watching, and it has been stuck in my head ever since. So, overall I believe 6 is the best score i can give for a legendary anime. Think you know everything there is to know about anime? Think again. Here are 10 anime facts you've probably never heard of before!